Author(s): Sameer Mohammad. Experimental Medicine, King Abdullah International Medical Research Center (KAIMRC), King Saud Bin Abdulaziz University for Health Sciences (KSAU-HS), Ministry of National Guard Health Affairs (NGHA), Riyadh, Saudi Arabia. Apart from functioning as an energy source and important structural components of biological membranes, Free Fatty acids (FFAs) play a key role in the regulation of metabolic homeostasis. FFAs activate specific G-protein coupled receptors (GPCRs) in pancreatic β-cells, immune cells adipose, and intestine. GPR40 (also known as FFA receptor 1) is primarily expressed in pancreatic β-cells and is activated by medium-chain and long-chain FFAs. GPR40 has been shown to augment glucose dependent insulin secretion (GDIS) from pancreatic β-cells and is widely studied drug discovery target for the treatment of type 2 diabetes mellitus (T2DM) and other metabolic diseases. 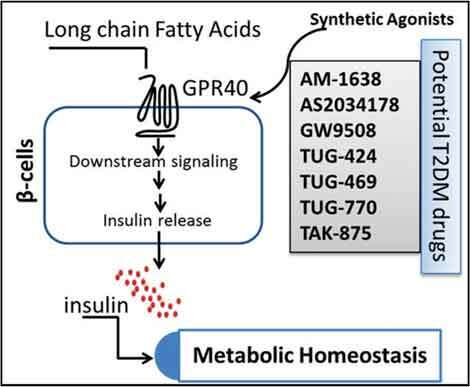 Several synthetic agonists of GPR40 augment insulin secretion from pancreatic β- cells and consequently improve glucose tolerance and restore metabolic homeostasis in various rodent models of T2DM. GPR40 agonists TAK-875 and AMG 837 have reached clinical trials and TAK 875 was shown to improve glycemic control in Type 2 diabetic patients. However, phase III clinical trials involving TAK-875 were recently terminated due to signs of liver toxicity in patients. Despite this setback, therapies based on GPR40 agonism provide an attractive alternative in the discovery of new anti-diabetic drugs. This review summarizes our current understanding of the physiological functions of GPR40, benefits and future prospects of GPR40 agonists to treat patients with T2DM. Keywords: Type 2 diabetes, free fatty acid receptors, GPR40, insulin resistance, pancreatic β-cell dysfunction, G-protein coupled receptors. Affiliation:Experimental Medicine, King Abdullah International Medical Research Center (KAIMRC), King Saud Bin Abdulaziz University for Health Sciences (KSAU-HS), Ministry of National Guard Health Affairs (NGHA), Riyadh, Saudi Arabia. Keywords:Type 2 diabetes, free fatty acid receptors, GPR40, insulin resistance, pancreatic β-cell dysfunction, G-protein coupled receptors. Abstract:Apart from functioning as an energy source and important structural components of biological membranes, Free Fatty acids (FFAs) play a key role in the regulation of metabolic homeostasis. FFAs activate specific G-protein coupled receptors (GPCRs) in pancreatic β-cells, immune cells adipose, and intestine. GPR40 (also known as FFA receptor 1) is primarily expressed in pancreatic β-cells and is activated by medium-chain and long-chain FFAs. GPR40 has been shown to augment glucose dependent insulin secretion (GDIS) from pancreatic β-cells and is widely studied drug discovery target for the treatment of type 2 diabetes mellitus (T2DM) and other metabolic diseases. Several synthetic agonists of GPR40 augment insulin secretion from pancreatic β- cells and consequently improve glucose tolerance and restore metabolic homeostasis in various rodent models of T2DM. GPR40 agonists TAK-875 and AMG 837 have reached clinical trials and TAK 875 was shown to improve glycemic control in Type 2 diabetic patients. However, phase III clinical trials involving TAK-875 were recently terminated due to signs of liver toxicity in patients. Despite this setback, therapies based on GPR40 agonism provide an attractive alternative in the discovery of new anti-diabetic drugs. This review summarizes our current understanding of the physiological functions of GPR40, benefits and future prospects of GPR40 agonists to treat patients with T2DM.